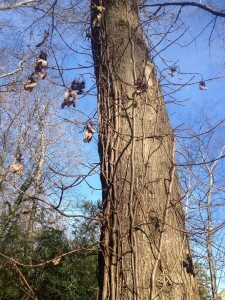 The last couple of posts have taken a tour through my southern garden in the midst of winter. This is just one garden. The design possibilities of winter gardens in the south are as endless as there are plants to choose from and the creative (and physical) force to make it happen. On this walk, there are a few shrubs highlighted, a vine, an evergreen perennial, and some bulbs. So, here’s a little bit of everything to whet your appetite for spring and the long summer to follow. With the below normal temperatures we experienced earlier this month, some of these shrubs may not bloom as I’d expected…this is truly one of the perils of gardening in the south. It’s impossible to cover everything! 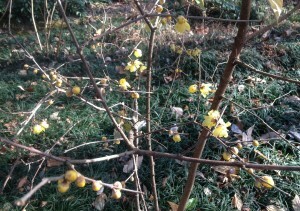 One shrub that I’ll need to cut back after it blooms this year is Chimonanthus praecox, or Wintersweet. It certainly lives up to its name, as its many pale, bell shaped, yellow flowers are indeed quite fragrant and bloom over a long period. The first day I catch a hint of Wintersweet on the air I know it’s the new year in the garden. Its fragrant blooms are followed by the even more heavily scented daphne odora next month. Fragrance each month of the year should be everyone’s goal in the garden! For pretty flowers in late spring and glossy evergreen foliage, the mountain laurel, kalmia latifolia, can’t be beat. I’ve planted two small ones along a slope, hoping they’ll eventually create a tall evergreen thicket as a back drop to the spike winterhazel (corylopsis spicata ‘Ogon’) that’s planted in front of them. My friend, and noted gardener, Weesie Smith, always said I must deadhead the blooms of the mountain laurel (and pieris too) to ensure blooms the next year. I do this faithfully…though it’s difficult with the pieris as there are so many! 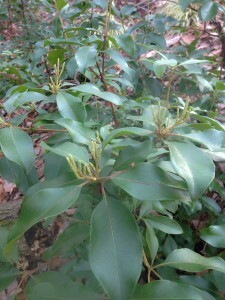 Both the mountain laurel and pieris are loaded with buds this year. 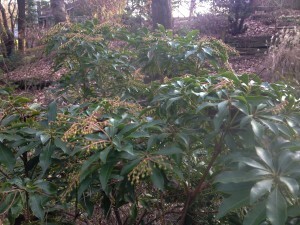 The pieris will bloom first, with many, many tiny dangling white bell shaped flowers along its branches. How beautiful it is in the height of spring! 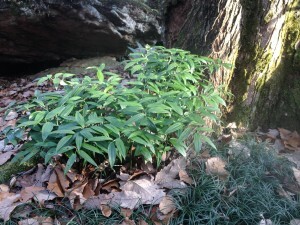 Planted at the base of a large elm are some evergreen solomon’s seal, disporopsis pernyi. This evergreen, slowly spreading perennial groundcover is right at home in a woodland garden, offering white, bell shaped flowers along the stems in early spring. This clump makes a good green counterpoint to the variegated Solomon’s seal in the same area that dies back each winter. It is truly a beautiful addition to any garden. A vine with a scary name, Schizophragma hydrangeoides ‘Moonlight’, is also quite beautiful…though January might not be it’s best month. Also known by it’s common name, climbing hydrangea, because its blooms resemble those of the hydrangea, it was planted at the base of a tree and now has reached almost to the top, at least 30′ in the air. Its blooms will cover the tree trunk in mid summer, reaching out and away from the trunk. Though it took a few years before it bloomed, it has bloomed now reliably each summer. 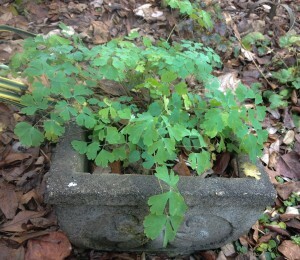 Closer to the house, up in the herb garden, a columbine has seeded itself in a small, concrete planter. This is aquilegia chrysantha, with light yellow blooms on long spurs in late spring. The original columbine, a gift from a friend, is long gone, but this one found a happy home and has been here for a few years now. The extra drainage offered by the planter is appreciated by this columbine. All I’ve had to do is clear fallen leaves from the crown of the plant. It hasn’t died back yet; though, with colder temperatures, it might. The ipheion, a little bulb that has slowly been spreading in this area, is now showing it’s short, strappy bulb foliage. 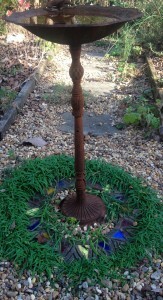 The soft blue blooms will appear in early summer, ringing the base of this birdbath. It’s been one of my favorite bulbs since it’s easy to grow and naturalizes so readily. And, even more importantly, the squirrels and chipmunks don’t seem to care for it! As you can see, there’s more than meets the eye in the January garden, and, if you know where to look, the promise of an entire season to come! This entry was posted in January, Perennials, Tree/Shrubs, Vines and tagged aquilegia chrysantha, chimonathus praecox, columbine, disporopsis pernyi, evergreen solomon's seal, iphieon, kalmia latifolia, mountain laurel, pieris, schizophragma hydrangeoides 'moonlight', winter garden, winter shrubs, wintersweet on January 18, 2014 by Kris Blevons.